Maybe it is the excitement of the Temple cleansing but somehow this quiet passage of Jesus spending time with those needing healing and children has always missed my attention. Seeing them side by side now I must say I initially found them odd. At first glance there seemed to be such a distance between the two events. 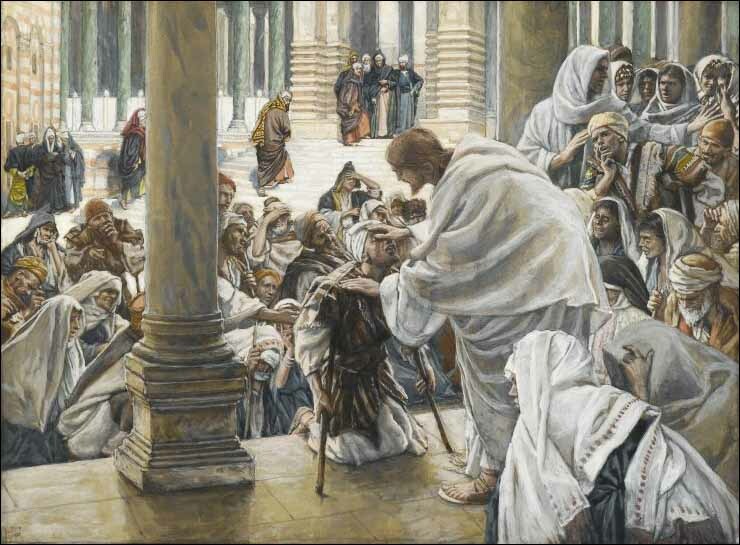 During the Temple cleansing Jesus was angry. He was tossing tables, scattering coins, herding livestock, and shouting scripture passage in a prophetic fervor. In this second picture we see Jesus doing what he often does. He is healing the sick, and he is spending time with children. Here Jesus is being warm, caring and compassionate. Again these two images side by side seemed initially at odds to me. Then it hit me. Both of these stories get to the very heart of Jesus’ mission. Both of these stories about about drawing outcasts closer to God. Jesus cleared the Temple because the presence of the merchants meant Gentiles seeking God couldn’t draw near, they were blocked out. Likewise it was thought that God had little for the lame, the blind or for children. But here (and many times before) Jesus is performing an act as defying to the current religious system as clearing the Temple. Jesus is stating God does love imperfect people. God wants imperfect people to draw near to him. This is a very good thing for us, since we are all imperfect people. Today during Holy Monday take some extra time to draw near to God. After all he has gone to great lengths to draw near to you.